Today Christie from A Kitchen Hoor's Adventures has us celebrating National Grilled Cheese Day. I've posted several fun versions in the past: Gluten-Free Grilled Cheese and Grilled Gruyère on Rye with Crisped Sage and Pink Lady Slices; Queijo Coalho (Brazilian Grilled Cheese) is a little less than traditional, but still one of our favorites! Whenever I set about creating a 'grilled cheese' we have a robust debate about what that really looks like. 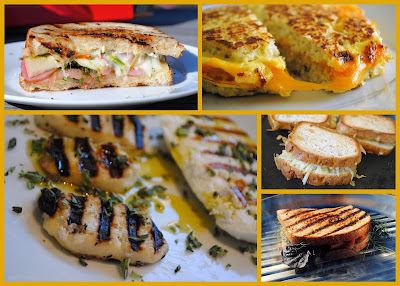 Long ago we decided: if there's bread, cheese, and grilling involved, it's a grilled cheese. Tonight I served these and the boys looked at me skeptically. They didn't think this really belonged in a 'grilled cheese' event. It's more of a bruschetta than a real 'grilled cheese sandwich, Mommy. So, if that's the case, I apologize. I was sticking to the bread + cheese + grilling = grilled cheese. Thoughts?!? Heat the grill or grill pan and rub slats with butter. Once hot, place the baguette slices on the grill or grill pan. Watch them carefully so they don't burn. You just want them crisped with nice grill marks. Place on a serving platter. Top each grilled bread with a thick slice of burrata cheese and spread it over the bread with a spoon or knife.Sprinkle the toasts with basil and arrange quartered mini tomatoes on top of the burrata. Sprinkle with freshly ground sea salt and drizzle with olive oil. Serve immediately.